What is a Pop-up Satellite Archival Tag? X-Tags with Standard Rate (SR) programming measure depth, temperature, and light levels at 2-minute intervals. They store this entire time-series archived dataset in memory. If a tag is physically recovered, the archived dataset may be extracted, providing the user with a wealth of information from the full duration of the deployment. For example, an X-Tag with a 12-month deployment duration would provide over 750,000 total temperature, depth, and light-level measurements. Unfortunately, the entire archived dataset cannot be transmitted due to limited battery life and Argos system data throughput limitations. Instead, a smaller subset of data, termed the transmitted dataset, is carefully selected for transmission. This dataset is generated by a series of compressions applied to the archived dataset. PSAT PTT-100s with SR programming also measure depth, temperature, and light levels at 2-minute intervals. However, they do not store all of the measurements taken and only archive measurements taken approximately every 15 minutes. Thus, the archived dataset and transmitted dataset of a PSAT PTT-100 are the same. Although transmitted datasets still contain time-series depth and temperature data, the temporal and (sometimes) measurement resolutions are reduced relative to the 2-minute sampled data. The temporal resolution of the transmitted dataset decreases as the deployment progresses. If the tag is deployed for a short duration (<4 months), the temporal resolution in the transmitted dataset is 15 minutes. As the deployment continues (4–8 months), the 15-minute records are overwritten with 30-minute records. For example, a tag with a deployment duration of 8 months will have all of its 15-minute records overwritten by 30-minute records in the transmitted dataset while a tag with a 5-month deployment duration will have only a portion of the 15-minute records overwritten. Similarly, as the deployment continues past 8 months, the 30-minute records are overwritten with hourly records. The 2-minute sampled data of a fish tag with SR programming equates to a vast amount of information. Consequently, the measurements are carefully compressed and packaged into a format that can be successfully transmitted to Argos in the time frame permitted by the battery. Any method of compression is going to result in the loss of information, but our engineers have designed a compression technique that offers an optimal combination of measurement resolution, quantity of data records received, temporal distribution of records, and measurement accuracy. However, the compression techniques lead to the possibility of “delta limited” depth and temperature values in the transmitted datasets. These records may not capture the full extent of the depth or temperature time-series profile. First, we will explain delta limited depth values. Delta limited temperature values are very similar and are described at the end. Our method of time-series compression focuses on how depth measurements change between consecutive hours. For example, suppose at 12:00, the tag measures a depth of 50 m, and one hour later at 13:00, the tag measures a depth of 75 m. The change in depth for this hour (termed “delta value”) is 25 m.
Periodically through the day, full-resolution depths are designated as a reference for the subsequent delta depth values. Consider the following transmitted depth data example. The depth measurements during the hour of 12:00 (12:00, 12:15, 12:30, and 12:45) are designated as accurate reference measurements. The delta values are not necessarily calculated with respect to the previous depth record, but rather delta values are calculated with respect to the measurement 60 minutes earlier. There is a limit to the change in depth (or "delta") that can be accurately represented in the transmitted dataset. 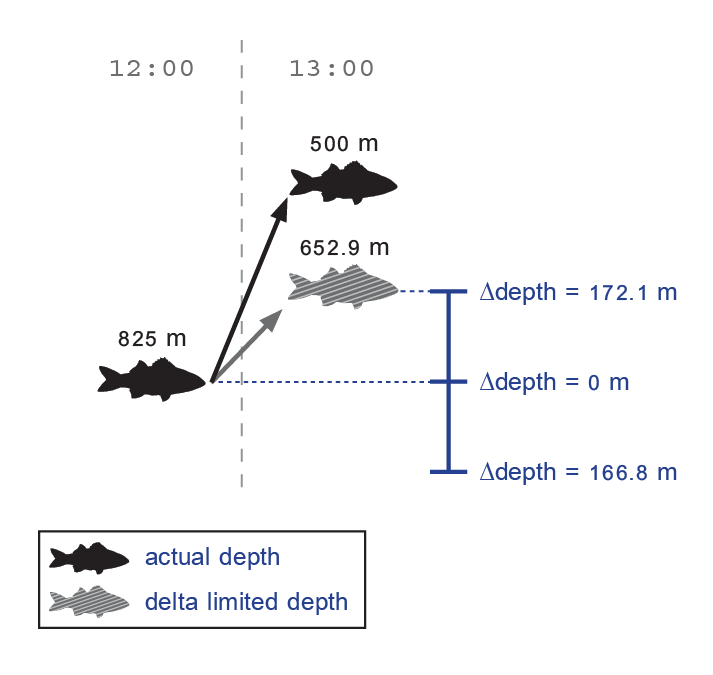 If a fish descends more than 166.8 m or ascends more than 172.1 m from the previous corresponding hourly time slot, the actual descent or ascent cannot be accurately represented and the depth record is identified as "delta limited" in the transmitted dataset. 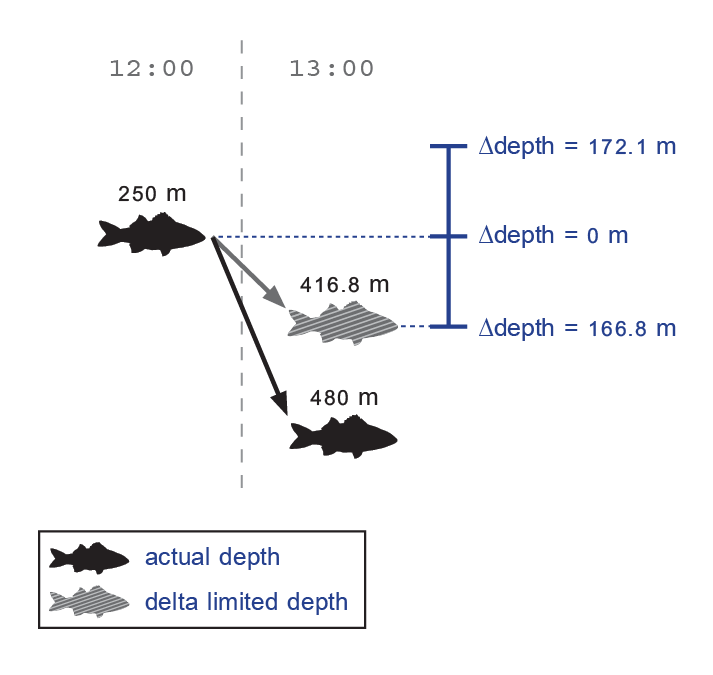 Suppose at 12:00 a fish is recorded at a depth of 250 m, and one hour later at 13:00, the tag measures a depth of 480 m. This is a depth difference of 230 m, but only a maximum change (descent) of 166.8 m can be represented in the transmitted dataset. Since the change in depth (delta) between 12:00 and 13:00 is beyond the allowed range, the descent is limited to 416.8 m (250 m + 166.8 m). In the final data report, the depth for 13:00 would be identified as 416.8 m, and it would be marked as a delta limited descent. It may take time for delta limited depths to “catch up” to the actual depth. The following illustration shows a sequence of depths over four consecutive hours. In this example, suppose an accurate reference depth is designated at 16:00. 16:00–17:00 The actual change in depth from 16:00 to 17:00 (230 m) is beyond the allowed range (>166.8 m), and therefore, the descent is limited to 416.8 m (250 m + 166.8 m). 17:00–18:00 The depth record at 18:00 is calculated relative to the delta limited depth (416.8 m) at 17:00. Even though the actual depth difference is only 110 m, the change relative to the delta limited value is beyond the allowed range (>166.8 m). Consequently, the depth at 18:00 is limited to 583.6 m (416.8 m + 166.8 m). 18:00–19:00 The depth record at 19:00 is calculated relative to the delta limited depth (583.6 m) at 18:00. The change in depth (26.4 m) is within the allowed range, and therefore, the depth at 19:00 (610 m) is accurately represented. Consequently, at 19:00, the delta limited depth records have caught up with the actual depth records. In the final data report, the depth records at 17:00 and 18:00 would be marked as delta limited descents, signifying that the fish could have been deeper than indicated by an unknown amount. 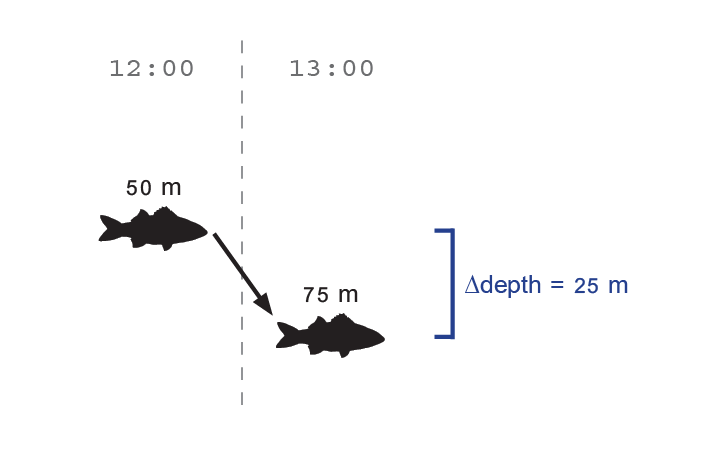 Suppose at 12:00 a fish is recorded at a depth of 825 m, and one hour later at 13:00, the fish ascends to a depth of 500 m. This is a depth difference of 325 m, but only a maximum change (ascent) of 172.1 m can be represented in the transmitted dataset. Since the change in depth between 12:00 and 13:00 is beyond the allowed range, the ascent is limited to 652.9 m (825 m - 172.1 m). In the final data report, the depth for 13:00 would be identified as 652.9 m, and it would be marked as a delta limited ascent. 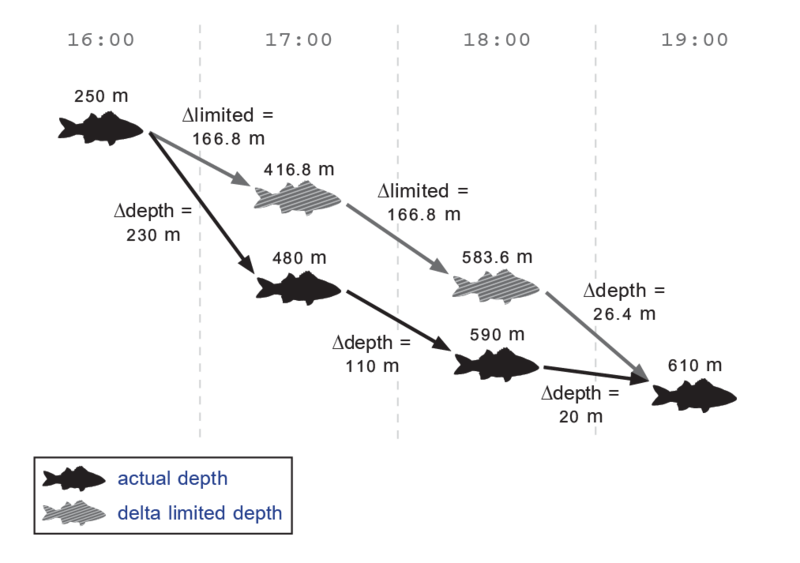 In summary, if a depth record is identified as a delta limited descent in the transmitted data report, then the actual depth of the fish could have been deeper than the delta limited descent depth. If a depth is identified as a delta limited ascent in the transmitted data report, then the actual depth could have been shallower than the delta limited ascent depth. NOTE: Delta limited depths are generally rare and may compose only a small portion of the depth dataset. Similar to depth data, there is a limit to the change in temperature that can be accurately represented in the transmitted dataset. If temperature changes beyond the allowed limit, the actual temperature cannot be accurately represented and is identified as delta limited. The delta limit for temperature is not a fixed value, but rather the limit depends on the temperature values, varying between 4.84–7.01 °C. Full-resolution temperatures are designated as a reference for subsequent delta values periodically throughout the day, and delta values are calculated between measurements separated by 60 minutes. In summary, if a temperature record is identified as a delta limited increase in the transmitted data report, then the actual temperature could have been higher than the delta limited increase temperature. If the temperature record is identified as a delta limited decrease in the transmitted data report, then the actual temperature could have been lower than the delta limited decrease temperature. NOTE: Delta limited temperatures are generally rare and may compose only a small portion of the temperature dataset.